The report starts with public enemy #1: Earthworks and rehashes the Frack Free Denton campaign that Denton voters won by a 60% democratic vote in a predominately Republican town. 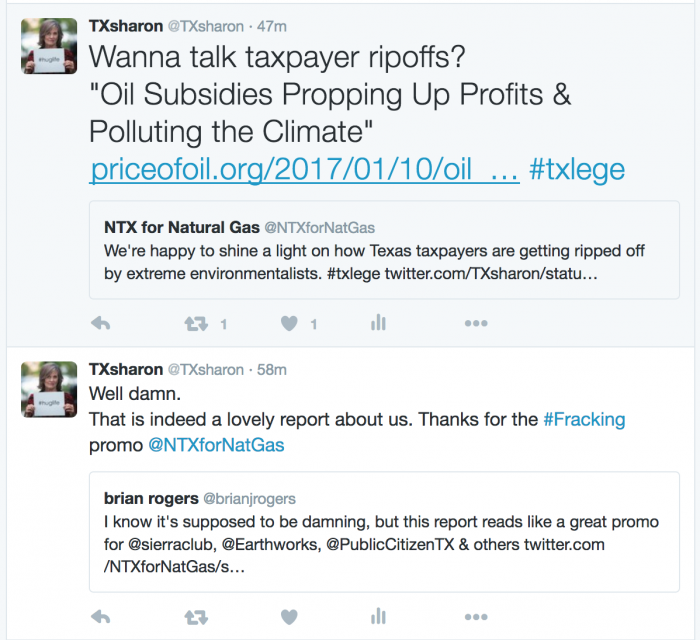 That’s how bad Texans hate fracking. Earthworks supports The Fracturing Responsibility and Awareness of Chemicals (FRAC) Act. Earthworks supports The Bringing Reductions to Energy’s Airborne Toxic Health Effects. Earthworks supports a whole bunch of other stuff that people like but fracking corporations don’t like. Earthworks has a Gulf Region Organizer who happens to also be a 5th generation Texan and is little old me. Earthworks has a South Texas Organizer who is a 3rd generation Texan from the Valley. In fact, this Earthworks Damn Good Report is so damn good, I’m going to use it as a fundraiser, right here and right now. Read the report, or take my word for it, and make a donation so Earthworks can continue being Damn Good.